Who Was Martin Mcguinness, What Did He Die of, Who are His Family Members? Irrespective of your stance on the conflict between the British Army and the Irish Republican Army (IRA) in the 1970s up till the late 1990s, you clearly have to accord a certain level of respect and admiration to Martin McGuinness. He was a former leader of the provincial Irish Republican Army and the first deputy minister of Northern Ireland. To most people, especially those of Irish descent, he was a national hero and treasure, a man known for finding troubles to deal with instead of sitting down waiting for them. Here is all you need to know about Martin McGuiness – his life, death, legacy and family members. James Martin Pacelli McGuinness was a former leader of the IRA and First deputy leader of Northern Ireland. He was born on the 23rd of May 1950 in Londonderry, Northern Ireland. There is very little information available about his early childhood as a result of lack of proper documentation at that period he lived. However, it’s known that he had his primary school education at St Eugene Roman Catholic Primary School. During his high school days, he was known to be good at sports and was a die-hard Manchester United fan. After graduating from primary school, he attended the Brow of the Hill Christian Brothers Technical College but had to quit at the age of 12 as a result of him failing the 11 plus examinations. After quitting school, he worked for several years as an apprentice butcher in Londonderry. In 1979, he decided to join the IRA due to the deployment of British troops to the streets of Londonderry, leading to the prejudiced killing and injury of innocent civilians. Barely two years after joining the army, McGuinness was promoted to the rank of Second in Command on the 30th of January 1972 (Blood Sunday) after British soldiers shot 28 unarmed civilian protesters, killing 14 and leaving several others injured. On the 7th of July 1972, McGuinness, alongside Gerry Adams, led a six-man delegation to London by the British government for negotiations with the then Northern Ireland secretary of state William Whitelaw but nothing came out of it, as the killings continued. In 1973, he was arrested in Dublin close to a car carrying 110 kg of explosives and large rounds of ammunition totalling 5000. He, however, claimed not guilty, stating he fought against the killing of his people and how incompetent it was for a juryless court to set a trial for him. For this, he was sentenced to six months in prison. After being released from prison, he joined the Sinn Fein political wing of the republican movement and rose to the position of first Northern Commander of the IRA in 1977. The year 1982 saw a switch in the mode of approach by McGuiness as he turned to politics as a means to effect a change in the treatment of Northern Ireland by the UK instead of guns and force, with him eventually going on to win a seat at the Assembly elections on the 20th of October 1982. On the 31st of August 1994, he and other provisional rulers of the IRA declared a complete Cessation of violence after 25 years in what was popularly referred to as the Belfast Agreement. Ever since taking to politics, McGuinness went on to achieve several huge feats such as becoming the minister of education in December 1999. He also went on to become the first deputy minister of Northern Ireland in May 2007 but resigned on 8th of January 2017 as a result of the Renewable Heat Scandal. On the 21st of March 2017, news about the death of Martin McGuinness spread like wildfire, leaving the entire people of Northern Ireland, Britain and The UK in shock and total disbelief. He was known to lead a very healthy life as he detested smoking or drinking, making people even more concerned about the cause of his painful exit. Medical reports later showed that he was suffering from amyloidosis – an incurable disease that’s known to exhibit symptoms like diarrhoea, enlargement of the tongue and spleen, bleeding, swelling of legs, fatigue and fainting. It was later discovered that McGuinness was diagnosed of this in December 2016 and told to cancel his intended trip to China, which he did but decided to keep the information about his health away from the media. Martin McGuinness was hospitalized on the 6th of March 2017 at the Derry’s Altnagelvin Area Hospital after falling seriously ill. His condition grew worse at the hospital until he eventually gave up the ghost on the 21st of March 2017. On the event of his death, there were lots of condolences to his wife and family members by several world leaders such as the Queen of England, George Bush, and British PM Theresa May. See Also: Life and Death of Muammar Gaddafi: How Did He Die, What Was His Net Worth? Not much is known about the family of late Northern Irish politician Martin McGuinness as he was much of a private person. Nevertheless, recent reports reveal his parents’ names to be William McGuinness (Father) and Peggy McGuinness (Mother). He is also known to have two brothers who go by the names Tom McGuinness and Paul McGuinness. His older brother Tom is a former Irish Gaelic footballer considered as one of the county’s greatest players till date while his younger brother Paul was also a footballer who played for CandyStripes. 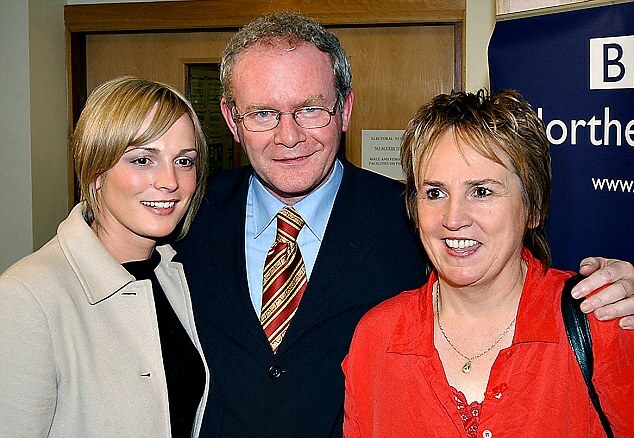 Martin McGuinness is also known to have a wife whom he loved so much in the person of Bernadette Canning. They met in 1973 while McGuinness was still at his military prime and got married in 1974. He and his darling wife Bernadette remained together until his death. They are both parents to four children – Fionnuala McGuinness (daughter), Emmet McGuinness (son), Grainne McGuinness (daughter) and Fiachra McGuinness (son).